I've spent much of the last 24 hours sniffling back tears and trying to stuff away images of what might have been and what really was. 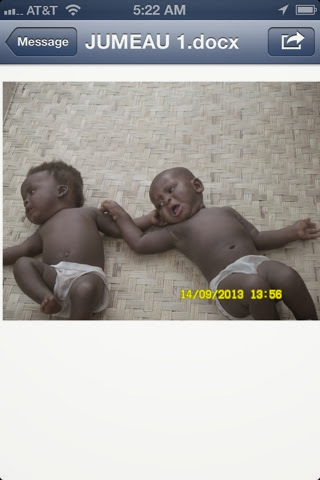 Last night, exactly one month after receiving our referral for the twins and seeing their picture, we learned that our little boy and girl, Omba and Shako Mbodi, died of dysentery. They died on Friday, a day that I spent much of my time researching water purification techniqies after learning of the horrible epidemic of deadly disease at the orphanage. I got details and suggestions for solutions, then contacted companies to come up with a plan. I've always been a planner; I plan ways to fix problems. That's what I do. Little did I know that on the other side of the world our sweet little baby boy and girl were dying of a disease so ridiculously preventable and treatable it hurts. Knowing dysentery was a real killer, we guarded our hearts for a little while there...we had been warned the disease was going around when we accepted the referral. However, we found it to be extremely difficult and preposterous to guard our hearts to eliminate growing feelings for our own children. I hoped--made myself believe--the twins would be stronger because they had eachother, and the fact that they made it past the first round of deaths sent my hopes up, too. I grieved for those first little ones who died early on, and I hurt for those families. You can definitely love a child you've only seen in a picture, and I knew those families were hurting. But after grieving, I thanked God for protecting our Littles and we began envisioning the future Lotz family. We listed possible names; cute names to go on perfect little adoption announcements displaying pictures of our amazing little miracles. I began picturing our house full of kids...eight little white, black and tan legs running up and down the hallway and jumping on beds. Eight little hands and 40 little fingers spilling food and drinks, and four perfect little round heads laying on my shoulder. And while we dreamed, they were struggling for life. Oh, how I hope they knew they were loved. I hope they felt that love in their last few moments, because I would have given everything to be there with them, to hold them and rub their backs and stroke their hair. I would have laid their perfect little heads down in my shoulder and rocked them to sleep, then cuddled them all night. I was helpless. And, to me, that's the worst kind of hurt. Why do I say all of this? Because you need to know. You need to know that across the world, in some remote African village you (we) never knew existed, children are dying because they don't have enough clean water. Brad and I never would have known about this orphanage, this village, this problem until our agency chose to get involved. Now we know about this problem. And now we can do something to help. Our agency is working on solutions, which they have laid out in detail here. Please get involved if this strikes a chord with you in any way. We will grieve deeply for our children, and we will never forget them, but I expect that we will also rejoice grandly when the work we've been called to do in this situation is complete. We will accept another referral when we find a match. We do not want another child or children living in dangerous situations for one second longer than what is absolutely necessary. I will make no effort to determine the reason for tragedies such as these. He gives and He takes away, but we trust Him..The road is long and so hard--already--but the journey is changing us for the better and will continue to do so. We say yes to His calling. We will follow. Use our story for your glory. This is the only picture we had, but it depicts the first instant we fell in love with these kids. They were perfectly precious, and we know their Heavenly Father is wrapping them in His arms even as our own are aching to hold them. It is so deeply mysterious and absolutely amazing that we can love someone we have never met. Yet, it is incomparable to God's love. You guys are in our prayers. Thank you for opening your hearts like you have, and for trusting God for the bigger picture. Maybe not in this life, but there will come a day. So sorry for your loss. Your families will be in our prayers! I am so sad when I read this as we just talked Saturday at the volleyball tournament and you hadn't recevied this news yet. I am SOO SOO sorry for your loss! I pray that God gives you strength and peace during this difficult time. Your whole family is in my prayers. Read this and thought of you. Love you guys! Our first baby died in Ethiopia before we could bring her home. She was hospitalized for 9 days with pneumonia and we didn't even know she was sick. We had never experienced such a terrible pain, such great loss. We cried for hours just holding her little clothes and sunglasses. We did have a funeral for her at our church and that helped some. We also had a special memorial stone made for Terefech and put it in our garden. I will never understand..but we went on to love the next referral God placed in our hands. Blessings to you. We mourn with you. It's sad those beautiful babies died -- my heart goes out to you. However, they were never yours (which wouldve required court) and may not even have truly been in need of adoption -- seeing as they're in country with a barely functioning government with a massive corruption for the purpose of international adoption problem that doesn't seem to phase you. That the upwards of $35k in adoption fees you'll be spending to support human trafficking -- that CAUSES trafficking, PAYS for trafficking -- is lost on you. But The Lord knows and divine retribution can be a beautiful thing. You tried to commit evil by buying human babies -- who are now dead. Perhaps it's a message from Jesus? (Fail to heed it? Your 7 month old may turn out to have rad like litte Elsa, adopted at 7 months from Ethiopia. He a mom letunfold.com (aka habesha child) makes this abundantly clear.bibheart Jesus - for making his will known!!). Alisha, what is wrong with you? You're completely ridiculous. Divine retribution? That is the most heartless, blatantly false and twisted response to a blog post I've ever, ever read. Jenny - I've never commented on your blog but I couldn't have the last comment be the final one you read. God grieves with those who mourn - my heart hurts for you who I have never met so I can only imagine the sorrow for your beautiful twins. My prayers are with you. Jenny - I found your blog through Emily Y and I want you to know that I will be praying for your family. We are waiting to travel to adopt our 3rd and I know that this is every waiting parents nightmare. I have raised money for water wells in Africa (through World Vision) in the past and we sponsor children through World Vision. May God Bless all your efforts to help their orphanage. PS. I hope you delete that comment from A above and block her IP address. Don't listen to anything she had to say. This is heartbreaking. I don't know you, but I'm so, so sorry to hear of the loss of these two precious little ones. I pray that you will know the peace that passes all understanding even in the middle of this awful pain.